At ISD, we love to bring the community together! 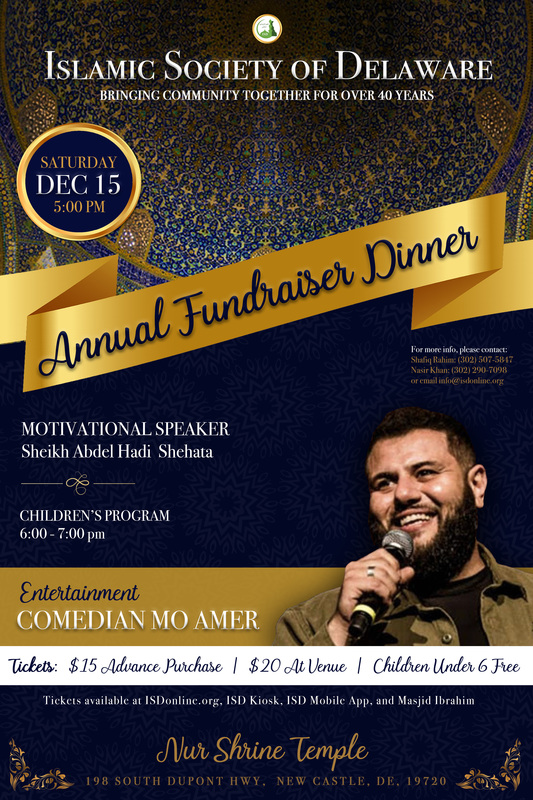 To celebrate the great work you have all been doing at Masjid Ibrahim, and to grow our community, we will be having our Annual Fundraising Dinner on Saturday, December 15th, In-sha’Allah and you are all invited. Our Masjid is a vibrant and an inclusive place Maasha’Allah. By the grace of Allah (SWT) and with the support of our volunteers and congregation, it has become a beacon of light for the Muslims in the tri-state area. It strives to cater to everyone’s needs - the young, the wise, the sporty or the academic, both male and female. It is a Masjid that is focused on connecting us with our Deen, tackling contemporary issues, reaching out to those in need and undoubtedly it brings the community together as one. In addition to reflecting upon the work we collectively have done over the last year at ISD, this evening is about getting the families together in a warm atmosphere enjoying delicious food, Halal entertainment and good company. We will also be looking towards the future and fundraising for the Masjid Expansion – to ensure that we can do more for the community and establish an even stronger Masjid for future generations, In-sha’Allah. Babysitting will be provided free of charge and there will be fun activities for children including Games, Interactive Show and of course balloons – you can’t have a fun time without balloons!! Please do join us on Saturday, December 15th at the Nur Shrine Temple; it’s going to be a very special night, In-sha’Allah. To take advantage of the 25% discount, be sure to purchase your tickets ahead of time! Fundraising tickets are available for purchase at ISDOnline.org, ISD Kiosk, ISD Mobile App and at Masjid Ibrahim. To buy the tickets now, please Click Here. Mo Amer is an Arab-American stand-up comedian best known for his iconic work with comedy troupe “Allah Made Me Funny” – the longest-running artistic collective of Muslim comic performers in the world. A pioneer in Arab-American stand-up, Amer’s humor is part-improvisation, part-memoir – detailing his circuitous life route, including how he managed to travel the world without a passport for two decades. Originally from Kuwait, Amer fled to the United States as refugee in 1990 and became a U.S. citizen in 2009. He currently resides in Houston, Texas with his family.